I get asked often "what tips do you have for connecting more with tarot cards?" so I decided to compile my own favorite ways! I'm always looking to dig deeper in my tarot practice, some come by accident even. While yes, you can read playing cards like tarot cards, but this isn't the cartomancy I'm talking about. I took an online course called "Your Future is in the Cards" taught by Kristen of Over the Moon Oracle Cards. It is basically a how-to for reading playing cards in its own system. Cartomancy has truly changed how I view tarot and how I break down a reading. By learning how to read playing cards, it really gave me a new layer to look at with my tarot cards. It helped me see card positions differently, ways the court cards interact, and extra little things to look for in a reading like numerical themes. Not to mention, cartomancy is so much fun - it's like being a detective and following the bread crumbs. Another online course I took through Kristen was called "Doodles for Divination". I'm actually wrapping this course up now! This is Kristen's recent course that really packs a punch and has been extremely eye opening! It's like handwriting analysis meets sketchbook. The course has me looking at symbolism and art in a whole new light, especially with indie decks. I've been picking apart the cards in my decks, researching every little nuances I find. It's brought new layers to my cards and has me looking for little symbols everywhere I go. I'm obsessed! I've always been a huge believer that everything is a sign and everything has a message. This course really confirmed that for me, it's crazy how our mind speaks and shows up to the plate. Another thing that can be easily done is just simply explore around your city, backyard, house, anywhere! Pull a card in the morning, not for guidance or anything, but just pull a card and keep it on your mind throughout the day. Look for that card in your day, while you're at the store, sitting in traffic, anywhere. Say that you pulled the 2 of Coins - look for double number two's, twin circles, anything being balance or unbalanced, maybe you found two quarters in your bag, etc. You can look for imagery that reminds you of the card itself and situations you come across. It's a great way to build up your own relationship with the cards that is unique to you. Anytime I dive into my Marseille studies, it always adds more depth to my other tarot readings. Marseille has such a neat language it speaks, it's much more fluid than it appears. While yes, numerology plays a big role in Marseille but it's more about how the imagery flows for me. The way the courts are looking and acting towards the other cards. The opening and closing of vines, flowers and swords. Even if you learn just a little about the Marseille system, I really think it will for sure add an extra boost to your RWS deck readings! If anything it will spark some inspiration to work with. If you like documentaries, I highly recommend watching Tarotology by Enrique Enriquez. It is an absolutely an amazing film! I've watched it at least 4 times already and will watch it again. I also recommend the book "Tarot on Earth" by Tom Benjamin, it's written like a workbook for learning Marseille and it's great fun! One thing I love to do, especially when my mind is drawing a blank, is to use tarot cards to prompt my journaling. I'll pull 3-5 cards and write about 1/2 page per card, I do this often with my morning pages where I journal 3 pages each morning and I just can't think of anything else to write. Morning pages are like a brain dump for right after you get up each morning, doing them alone really helps me think more clearly during the day and reducing my stress! So for example, say the first card I flip over is the 6 of Cups, I'll journal about a good memory or something. Then the next card, say it's the Emperor, I'll write about my dad. Then the next, say it's The Fool, I'll write about an adventure I took... and so on. Doing this really helps me add more personal layers to the card meanings and associations. It gets my mind going and triggers my creative juices. Well, I hope these spark some interest in you and help add some new layers to your tarot practice! Be sure to let me know in the comments if you try any of these and if that help! What things help you connect more to the cards? Last week I took a small break from the weekly readings. I was pretty distracted and by the time I realized I forgot to post it, we were already well into Wednesday, oop's! 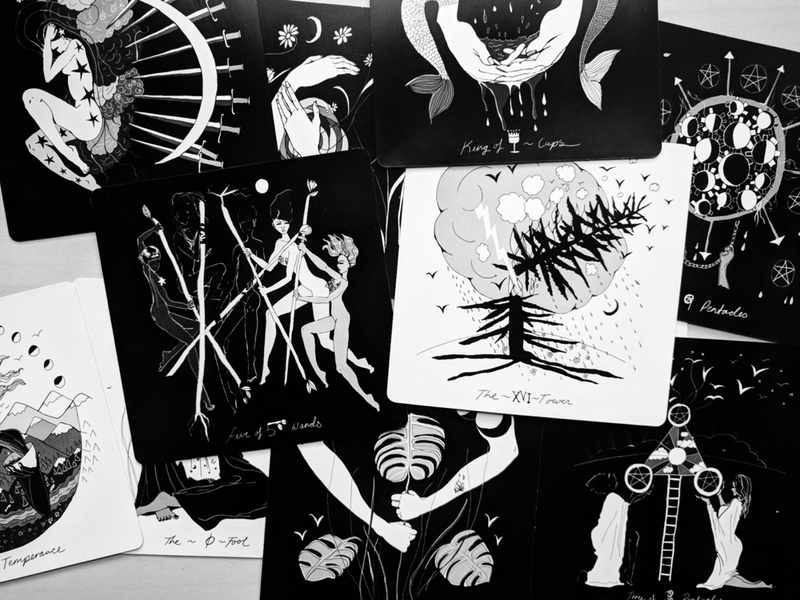 It's back this week though and I'm trying out a new deck that I just got yesterday, it's the Dark Days Tarot by Wren McMurdo. I received this deck in a trade along with one other deck, the adorable Marshmallow Marseille. I plan to do a deck review of Dark Days Tarot and the other deck soon! On the 11th we have a New Moon in Leo. I always get excited when the moon goes dark, it's one of my favorite phases to work with. Your mind sees the potential before the words can even escape your lips. If you're feeling this sudden flash of inspiration, grab it by the roots and take hold! It may help to collect all your idea's and thoughts into one big pile so that you can put things in better order. Anything that makes it easier to understand, especially with Mercury in RX, things have the tendency to get a bit muddy around this time. This also gives you a chance to see what needs more attention or what may be in a more mature state of mind. I love how on this card there's a hand gathering all the layers of this mountain and forming it into a sword handle. The mountain layers remind me of layers of our subconscious, ones that need to be consciously sorted and put into an order than makes more sense. You're in control with what you do, it's your sword to use. When the wheel is spinning, it's time to ask yourself, "do I feel lucky"? Are you ready to take a chance and see what happens? Or, are you going to play it safe and wait this cycle out? The Wheel of Fortune is asking you to take a leap this week and strike while the iron's hot! To me, this card is all about deciding what cycle you thrive in best so that your chances are higher and you end up on top... because that's obviously the most favored outcome, right? When working with fresh inspiration and the sharp clarity from the Ace of Swords, this may be your time to really send some of these idea's you have out into the world and test the waters to see what could possibly happen. It's like throwing the dice and trusting that the numbers are in your favor, sometime you win big... sometimes you lose it all. It really comes down to this, is it worth the opportunity? With the New Moon coming up later this week, it may be wise to hold off on anything fresh until then! After all, we're working with Ace energy and what better phase to work with than the New Moon! What do you see in the cards this week?